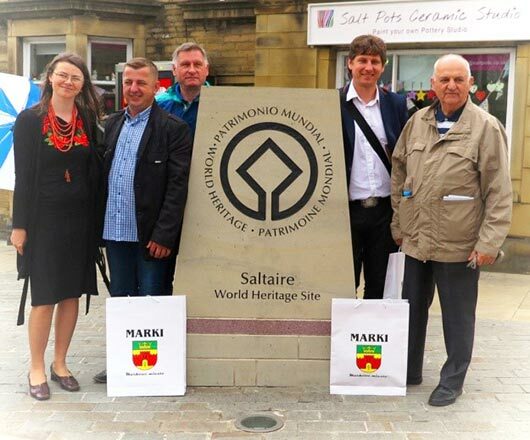 This week a group of Polish visitors from the town of Marki near Warsaw made a pilgrimage to Saltaire to seek out their historical roots. Their fascinating story began in 1883 when three Bradford industrialists: Edward and John Briggs of Briggella Mills, Bradford and Ernst Posselt long-resident of Victoria Park, Shipley built a large worsted mill and workers’ community in Poland which the Bradford Observer described as ‘a second edition of Saltaire’ in 1886. The last group from Marki to visit Yorkshire were 100 Polish girls, sent by Briggs-Posselt partnership to learn factory skills in 1883. Among this week’s delegation of Polish town councillors and history aficionados was Marek Borkowski whose grandmother and mother both worked at the Polish ‘Bradford Mills’ near Warsaw before the war. The group also included Antoni Widomski, president of Marki’s Volunteer Fire Brigade (inspired by the British industrialists’ Fire Watch established in 1884), along with volunteer fireman Dariusz Chmielewski. The visit to Yorkshire was instigated by town councillor and esteemed local historian Zbigniew Paciorek and capably organised by translator Bogusława Sieroszewska. Also among the party were the leader of Marki’s Town Council, Tomasz Paciorek and enthusiastic members of the Marki-Pustelnik-Struga Historical Society: Urszula Dzieciol, Agnieszka Szafranska, accompanied by reporter and documentary film maker Artur Rytel-Andrianik. 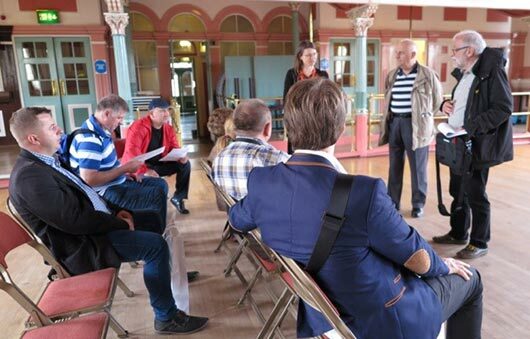 The group was guided by Dr Sarah Dietz who presented her research to the Saltaire History Group in 2013. Her book British Entrepreneurship in Poland: A Case Study of Bradford Mills at Marki 1883-1939 (Ashgate: 2015) will be published in July. During the visit to Saltaire Trevor Hart provided a very interesting walking tour of the World Heritage Site and generously invited the group see his home on Albert Street. the Polish group at Victoria Hall. The Poles were fascinated to hear about Maggie Smith’s research: Polish Journeys which describes the lives of older members of Bradford’s Polish community including several employees of Salt’s Mill; most notably Feliks Czenkusz. Maggie Smith, fourth from left. As Marki’s mill outside Warsaw was destroyed in 1939, it was particularly interesting for the Polish historians to visit Salt’s Mill and see what their own factory might have been like. 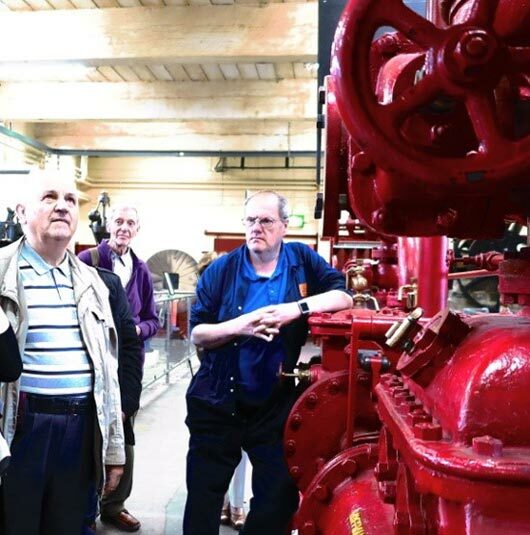 Mark Astley of Bradford Industrial Museum shows Victorian fire prevention innovations to Antoni Widomski. The Marki delegation’s visit to Bradford also included a tour of the Briggs brothers’ Bradford factory, Briggella Mills, on Little Horton Lane, by the owner Chaker Chamsi-Pasha. Trading under the name Hield since the 1920s, Briggella is one of very few Victorian mills in the city still producing worsted cloth for a thriving export trade today. Mark Astley explained the workings of a collection of vintage fire fighting equipment at Bradford Industrial Museum and the expedition finished at the former home of Edward Briggs, Westwood Lodge on the edge of Ilkley Moor, where Tim and Paula Edwards, joined by member of Ilkley Civic Society, Kate Brown, welcomed the group for a typical English afternoon tea. The people of Marki, near Warsaw, have always cherished their historic links to Bradford, now town councillors, Tomasz and Zbigniew Paciorek hope very much to revitalise the connection and show that the spirit of cooperation and shared history between Yorkshire and Poland dates from long before the war. Copyright: Dr. Sarah Dietz, June 2015.